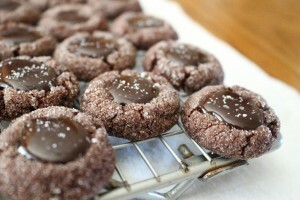 I have to say that I am somewhat of a chocoholic, and these definitely satisfy that. 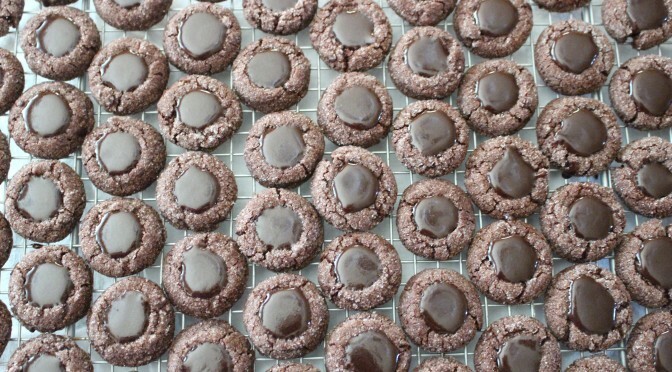 As is the case with thumbprint cookies, there is a little labor involved as you have to fill the cookies. These cookies, however, are definitely worth it. And nobody will guess that these are gluten-free and vegan . Preheat oven to 350˚. In a small bowl, whisk together xanthum gum, starches, flours, baking powder, cocoa powder, and salt. Set aside. In a medium bowl cream together margarine and sugar, and beat until fluffy. Add flax seed mixture, coconut milk, and vanilla; mix until combined. Add dry ingredients and mix until combined (it may take about a minute). Roll dough into 1-inch balls and then roll in sugar. Place one inch apart on a parchment-lined cookie sheet. Bake for 8-10 minutes, or until edges are set. Let cool on cookie sheet for 5 minutes. Using a teaspoon or a thumb, push down the center of the cookie to create a slight bowl. Combine honey, 1/3 cup coconut milk, vanilla extract and cinnamon in a medium saucepan over medium heat. Bring to simmer and cook until honey dissolves. Remove from heat, cover, and let sit for 10 minutes. Place chocolate chips in a small bowl. Pour honey/coconut milk mixture over chocolate and let stand for 1 minute. Stir until smooth. Add margarine, and stir until incorporated. Spoon ganache into the cookies (I use a baby spoon as it gives me the perfect amount of ganache to fill the cookie, making it less messy). 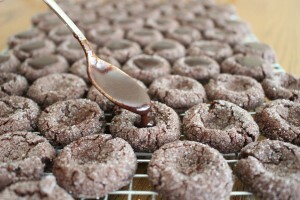 After about 15 minutes, the ganache will set, then you can transfer them to a container where they will keep for 2-3 days. They freeze well too, if you can't eat them all by then (which usually isn't the case with my family). 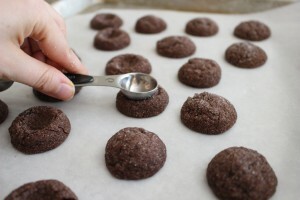 Something that I like to do with these cookies is sprinkle a little bit of sea salt on them, it gives the cookies some added dimension, and makes it a little more fancy.